Before Christmas, Supernatural wound up the first half of the season with three solid, if not particularly inspiring, episodes. In “Plush,” the writers tapped into a childhood fear many of us–including Sam–suffer from, turning a play-object, a dress-up mask, into something terrifying. The boys receive a call from Sheriff Donna Hanscum asking for their help with a case. A man in a large and quite disturbing bunny mask has attacked a man and though they’ve apprehended him, they’ve found it impossible to remove the mask. The Sheriff rightly senses that this is something up the hunters’ alley, and the boys, without any idea on how to deal with their current problem of the Darkness, agree to come take a look. Sheriff Donna’s instincts are good, it turns out because the violence quickly multiplies as other masked individuals are involved in attacks on two men, and Sam and Dean quickly determine that this is a case of ghost possession. Determining the spirit’s geas is a bit more complicated and leads down a very dark path that has the boys scrambling to save the sister and nephew of the ghost from his vengeance: one involving accusations of sexual abuse of children. 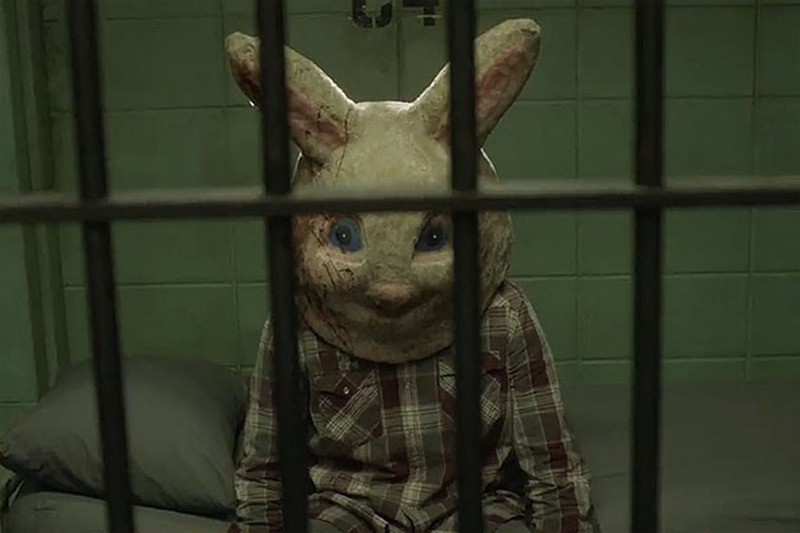 Supernatural is not the first text to make a connection between a disturbing bunny and child molestation. 1985’s Dreamchild gave us an Alice whose memory of her experiences with Lewis Carroll morphed her image of the March Hare into one of the most terrifying spectacles possible in a child’s story. And I wonder if the choice to use a rabbit mask in the first attack might not have been intentionally a link to that film, consciously or unconsciously. Lewis Carroll, like Chester in the episode, was accused (though posthumously in the former case) of inappropriate relations with children, but upon closer examination, most experts have concluded that it is unlikely that the author was guilty of anything sexual with the children with whom he had contact. Not that the episode isn’t enjoyable. With Briana Buckmaster back as Sheriff Donna, “Plush” was guaranteed to have great moments and they all involve her. It’s a tough character to play. Too much in one direction and her Minnesota-isms and desire to please become annoying; too much in the other and she loses folksy charm that makes her character work as a contrast (the Prairie Home Hunter). Buckmaster always plays it close to the edge but manages to hold it in check by letting the woman underneath—vulnerable but serious about her work and her choices—shine through at just the right moments. She’s now become a barometer, in seasons that are hit and miss, of an episode worth watching. “Just My Imagination” also deals with childhood, ostensibly from a more positive angle, though this is Supernatural, so that doesn’t last long. In this episode, another old friend turns up asking for help with a case, but he’s a very different kind of friend: Sam’s childhood imaginary friend Sully. Turns out that imaginary friends are real—they are a race of good beings who guide children (called Zanna)—and someone is bumping them off. The episode gives us a bit of insight into part of the Winchester brothers’ youth that we’ve never seen: a period when Dean was on the road with his dad and Sam was left behind to fend for himself. Alone, not attending school or given anything else to do but prepare himself to be a hunter, Sam was in need not only of companionship but the kind of guidance a Zanna could offer. And for a while, it seemed that Sully was going to be able to divert him into a more normal life. Fate unfortunately intervened, taking not only Sam down a certain path, but also starting a tragic cascade in Sully’s life culminating in the murder of his closest friends among the Zanna. Sam and a very sarcastic and reluctant Dean investigate the killings to reveal that sometimes, running away from the pain of one event can lead to even more catastrophic ones further down the road—an idea that will lead nicely into the next episode. This episode, though was filled with a variety of good elements. The idea of the Zanna themselves are largely a grab from Drop Dead Fred (1991), but as always, the writers on Supernatural are smart enough to source their content (this time through Dean). And like the out-of-control Fred played by Rik Mayall, the Zanna are friends that only a child could truly appreciate (like Weems, the mulleted, laundress and air-guitarist supreme). Their ability to relate sincerely with the kids and yet still interact with each other as adults who know the seriousness of their work felt right and added to their very human quality, Dean’s protestations notwithstanding. 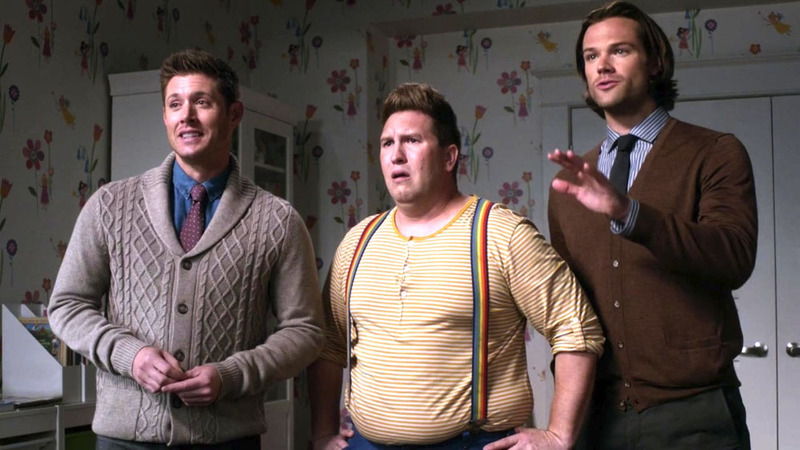 We also got treated to one of the most disturbingly funny scenes ever when Sam, Dean, and Sully investigation the murder scene of Sparkles, the “Manicorn.” The inability of adults to see the Zanna initially hid the carnage, but once revealed, it seemed even the deceased’s blood lived up to his name. When the child’s mother entered and began to tidy up, inadvertently coating herself in the glittery gore of the dead Zanna as the squicked and mostly speechless Winchester’s and Sully watched in horror (the latter’s “She’s got Sparkle on her face” is delivered perfectly by Nate Torrence), the audience squirmed along with them. Of course, the moral message of “Just My Imagination,” that Sully could not escape his responsibility for the death of one sister or the emotional well-being of the other, that he could not simply run away, was supposed to be a lead-in to “O Brother, Where Art Thou?” And while it was well and sensitively delivered in that episode, it largely fell flat in the latter episode which disappointed. One of the problems that we have seen in seasons ten and eleven is a fairly substantial one with pacing. One of the strengths of the show is the ability to keep the myth arc moving at an almost frighteningly fast clip even during freak-of-the-week episodes. During this last season and a half, the myth arc has instead slowed to a frustrating crawl with all of season ten eaten up by a storyline that would have taken earlier seasons three to four episodes to accomplish. This season, we have spent 8 episodes building to the conflict here, framed by Sully’s act of heroism in “Just My Imagination”: Will Sam have the courage to re-enter the cage with Lucifer? Instead, what we get is an episode that reworks what we have already seen a dozen of times in the series, and at least once before with pretty much the same players: a devil’s bargain (almost literally and then absolutely literally) to keep one of the boys from actually sacrificing himself to save humanity between the Winchesters, Crowley, Rowena, and eventually, Lucifer. The surprise, that Sam has not been receiving messages from God but from the “Morning Star,” shouldn’t be anything of the kind to anyone who has been watching the series with even half an eye. Nor should Lucifer’s play for freedom nor Sam‘s refusal to play along. 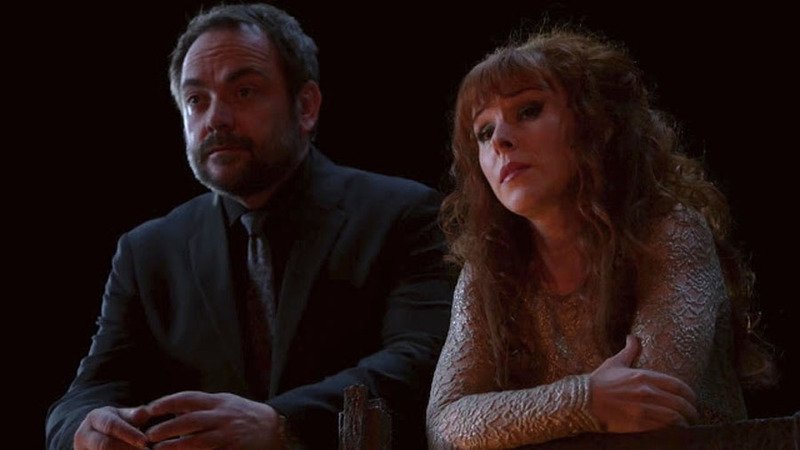 In fact, the entire exchange is so predictable that it’s hard not to read the body language of Crowley and Rowena, watching from a distance, slumped forward in boredom, as that of the audience. 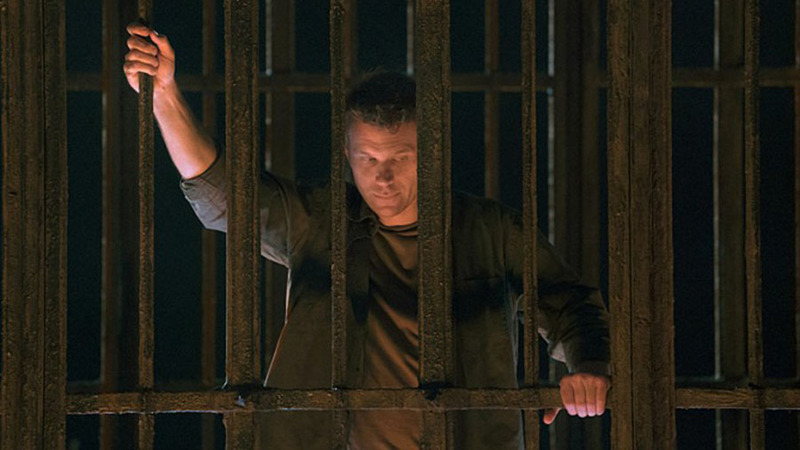 There is, of course, some tension in what will happen next, in that Sam is now trapped in the cage with Lucifer, and Lucifer clearly has plans for him, but I’d bet even money that he’s merely banking on the predictability of Dean risking Heaven, Hell and everything in between to break his brother out of the cage, thinking he can leverage Sam’s jailbreak to get out himself. Somewhat more interesting is the still nebulous intentions of Amara. She promises utter bliss for not only Dean but all of humanity while still insisting that everything will be hers and hers alone and that light will be stamped out. Lucifer may be the Prince of Lies, but there’s usually a hint of truth in what he says, and he makes it clear that Amara just isn’t one to deliver like she says she will. I am sure these will resolve themselves, but given the series track record of late, I don’t expect it to be anytime soon.